I have a love/hate relationship with food magazines. I get so excited when I see a new one on the newsstand or in my mailbox, with its glossy cover photos of delectable and artfully arranged dishes, and promises of “easy, fresh meals in under 20 minutes” or “10 spinach dishes you are guaranteed to love.” But inevitably I end up dog-earing maybe one recipe out of 100, and never get around to making that recipe anyway. That changed when I picked up the August issue of Food & Wine magazine last week. About 90% of the recipes look amazing to me, and while they’re a little fancier than what I might whip up on a typical weeknight, they all use easy-to-find ingredients and simple cooking techniques. The recipes contain a lot of fresh summer produce, and the dishes seem light without being “lite” (ie: healthy, but bland and unsatisfying). I don’t know whether Food & Wine is always this good, or I just happened across a particularly great issue, but I plan on subscribing to find out. I decided to use three of the recipes in a belated birthday dinner I made for my sis-in-law, Lauren, this past weekend. Usually I hesitate to make untested recipes for a special occasion dinner, but I just had a hunch that these would all turn out great. I pretty much followed the recipes exactly, and everything was delicious. For the tomato salad I used heirloom tomatoes from a local farmer’s market, just to give it a little more exciting color. 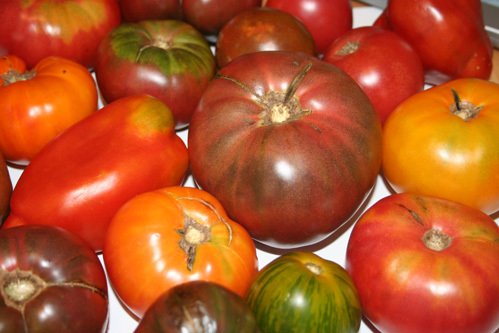 I was always scared of heirloom tomatoes until I realized they’re not really any different from regular tomatoes with the exception of their color. Making all three of these dishes was fairly labor intensive, and it was only possible because I had four people to entertain my wild children while I chopped, pureed, roasted, and sautéed. But each dish on its own would not be overwhelming at all. So if you come across the August issue of Food & Wine, I highly recommend picking it up. Or just poke around on their website – I think they post almost all of their recipes online. Since I was told firsthand that this was the most delicious dinner, I can't wait to try the recipes. I am so impressed......now you know your husband will want you to make it for him, too!!! Ooh, that tomato salad sounds good. I have the best sister-in-law ever! I can personally tell all you loyal readers that it WAS a delicious birthday dinner! But try it out for yourselves! Thanks, Lyss... love you!